One of the most famous Panzer 'Aces' of the war - Michael Wittmann began his career in a humble Stug III but by the Battle Of Kursk in July of 1943 Wittmann had command of the most famous Tank of the War - the Panzerkampfwagen VI 'Tiger'. 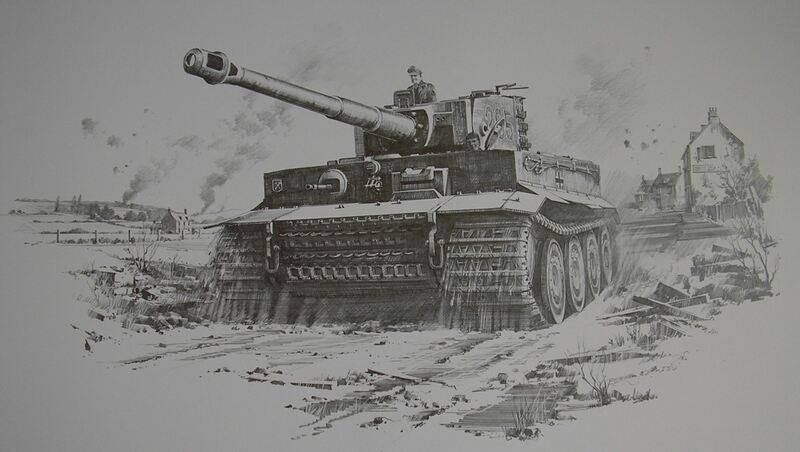 Wittmann continued to score heavily with his Tiger and it was when his Unit was moved to counter the threat of Allied Invasion in the West that he got the opportunity to test himself against the Western Allies. In the days and weeks after D-Day the Tigers of SS Panzer Battalion 101 fought a series of bitter engagements as the Allies tried to break out of their beachheads. This eventually led to Wittmann's most celebrated action - at Villers-Bocage! 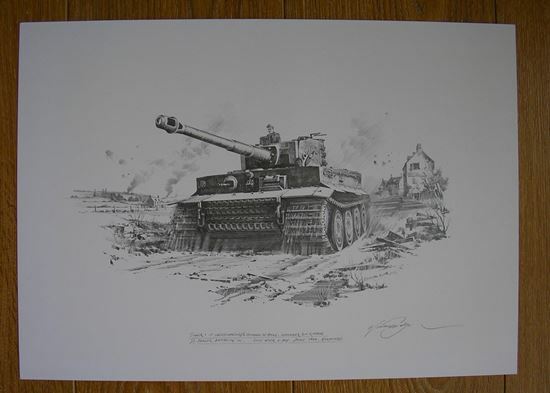 Nicolas Trudgian's superbly detailed Drawing shows Wittmann's Tiger '205' in the days following the Normandy Invasion in June 1944 as he leads the 2nd Company of SS Panzer Battalion 101 through a Normandy landscape showing the tell-tale signs of battle, the Tigers will soon make contact with the enemy. This fantastically detailed Drawing is on A3 paper 17.5 x 12.5 Inches.